Inspired by Royal Enfield’s role in serving the men in uniform, this rugged Camo Cargo is meant for the long road trips. Built for convenience, the trousers come with two cross pockets, a couple of cargo pockets on the thigh and back pockets on both sides. True to their name, the lucas Jeans look like a pair of regular jeans, but function like protective motorcycle pants. They are engineered to be the last line of defense against tarmac, and are designed to not look out of place off the saddle! A blend of cotton, Polyester and elastane fabric is known for its durability and resistance to abrasion, tears and scuffs, which makes it the perfect fabric for use in motorcycle jeans. A blend of cotton, Polyester and spandex fabric is known for its durability and resistance to abrasion, tears and scuffs, which makes it the perfect fabric for use in motorcycle jeans. True to their name, the Ace Jeans look like a pair of regular jeans, but function like protective motorcycle pants. They are engineered to be the last line of defense against tarmac, and are designed to not look out of place off the saddle! The ROYAL ENFIELD BOSCAGE CAMO CARGO GREY PANTS are made from heavy duty 100% cotton fabric. The ROYAL ENFIELD BOSCAGE CAMO CARGO OLIVE PANTS are made from heavy duty 100% cotton fabric. 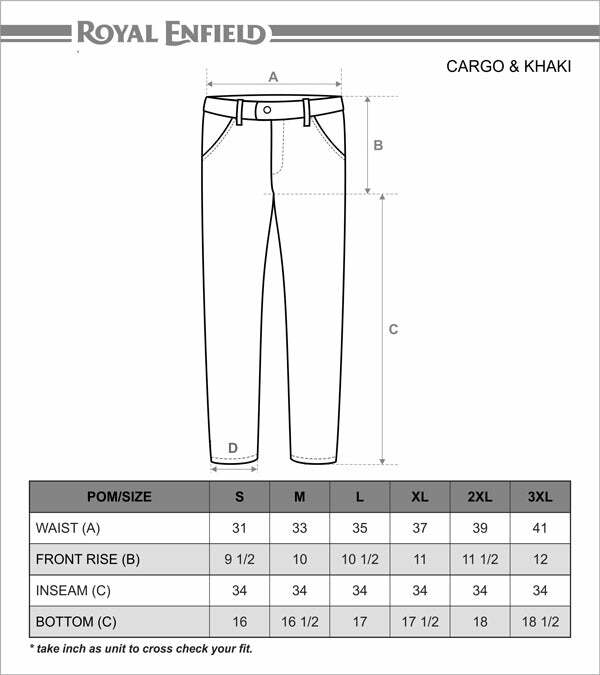 The ROYAL ENFIELD WEEKENDER KHAKI PANTS are made from heavy duty 100% cotton fabric. The ROYAL ENFIELD WEEKENDER CHARCOAL GREY PANTS are made from heavy duty 100% cotton fabric. True to their name, the Covert Jeans look like a pair of regular jeans, but function like protective motorcycle pants. They are engineered to be the last line of defence against tarmac, and are designed to not look out of place off the saddle! A blend of cotton, Polyester and Nylon fabric is known for its durability and resistance to abrasion, tears and scuffs, which makes it the perfect fabric for use in motorcycle jeans. A blend of cotton and Nylon, Cordura fabric is known for its durability and resistance to abrasion, tears and scuffs, which makes it the perfect fabric for use in motorcycle jeans. The ROYAL ENFIELD CONVERTIBLE CARGO JOGGER PANTS are made from heavy duty cotton stretch twill fabric. Add your own knee armour in the armour pockets provided, and our rugged Convertible Cargo Jogger Pants become the perfect urban moto pants. This product is a dyed garment. It may lose colour during the first few washes.